Total Noob and HacKmaN have ported their 6.38 TN HEN (which was shown as a proof of concept only and never publicly released) to 6.39 OFW and released it as 6.39 TN-A Hen. 6.39 TN-A was built from 6.20 TN-E so you can simply checkout the changelog from this post. This release also includes some bug fixes that didn’t get fixed in 6.20 TN-E like the psp go freezing while to your PC via usb, when no M2 Card is inserted, etc. 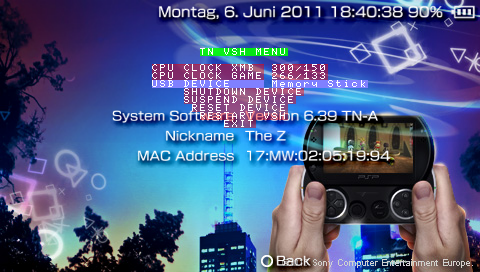 6.39 TN-A Hen supports Homebrews, 6.3X Plugins, PS1 Games (PSN PS1 Games and converted PS1 Games), etc. Important Note: There currently is no working ISO loader (even the Prometheus ISO loader isn’t working yet) for 6.39 TN-A Hen but ardi, the developer of aLoader has promised that he will port his latest release (aLoader 1.25) to 6.39. If you want a Hen or LCFW for 6.39 OFW with an ISO loader, you may want to look at 6.39 Pro-B6. hey this ardi aloader, does it work for tn hen 6.39? Nope. But ardi released his own version of 6.39 Hen complete with a working port of the aloader. Do note that it’s a different release from just 6.39 TN-A and the original aLoader plugin (which was built for 6.20 only). Check out 6.39 TN Xtended Hen here.